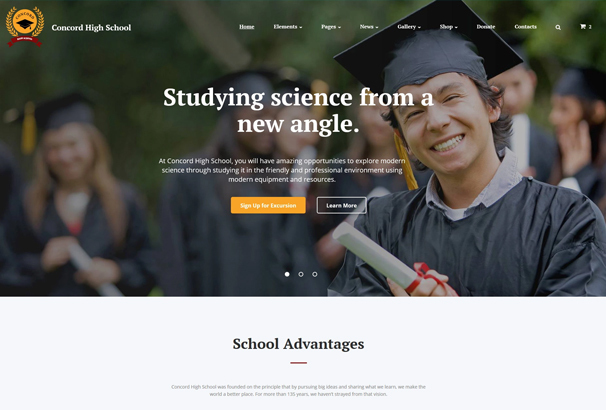 If you are looking to create an education website such as for a school, university, college, online learning or other things like dance schools or coking schools then this collection is for you. 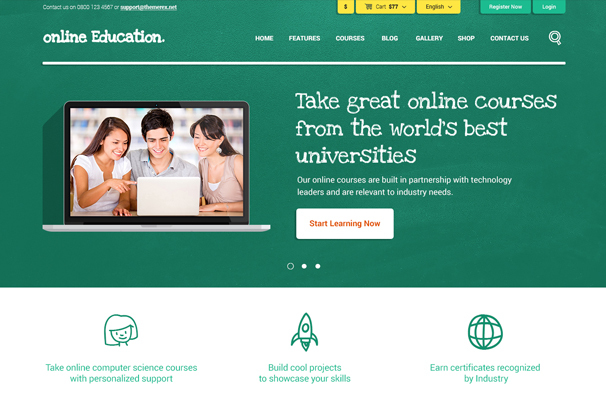 We have scoured the internet and put together a list of the very best education website templates. You can use these HTML5 and CSS3 templates as the basis for your design, the hard part of coding as been done for you so you can take one of these and simply tailor it to match your needs. These templates will allow you to change colors, add your logo and photography to make them unique to your website. Using a pre-built template such as these will save many hours of development time, so you will save money on development fees or even be able to use them yourself if you have some knowledge in this area. With a solid HTML template in place, you can then use it to code it into a CMS if required, popular options are WordPress, Joomla, Drupal or even a custom made system unique to your requirements. Another use for templates is for wire-framing, you can quickly get a working mockup made which you can use to present to clients to they can get a look and feel for how their finished site will look. 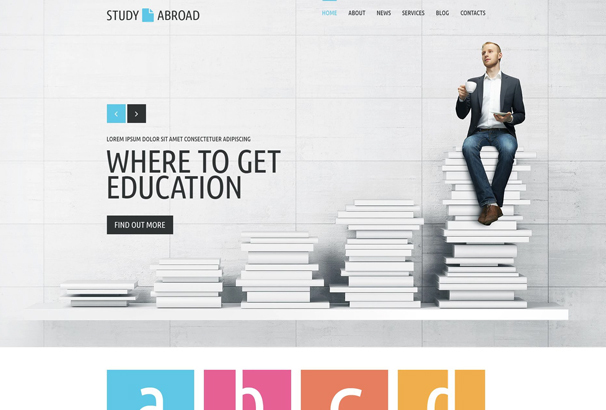 Take a look below and find the perfect educational website template. 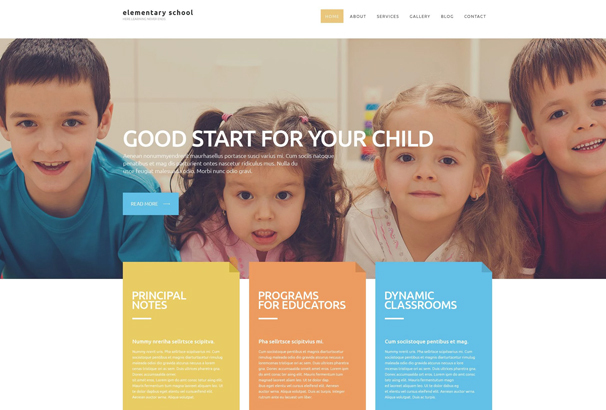 This highly responsive HTML theme is dedicated for kids education or kindergarten websites. It has a rich user interface with vibrant and fun colours which is very attractive for kids. There are more than 45 ready made pages and search and contact forms for you to start your project. The multiple gallery layout also ensures that you can fill up the website with cute interactive images. 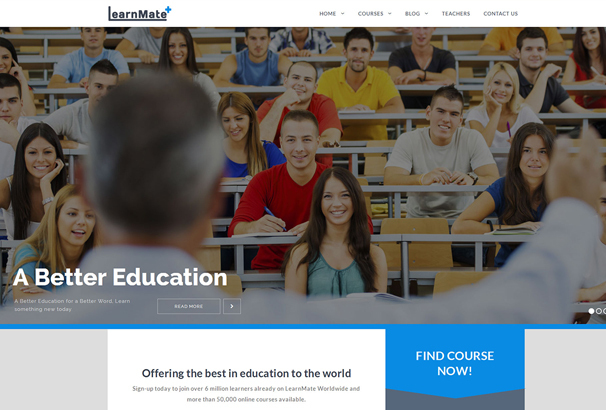 This template is designed for online education marketing. It comes ready with e-commerce functionality and a great immersive interface. The design combines beautiful imagery and appropriate text positions for maximum expression of your potential. There are also 6 blog layouts and multiple gallery types. 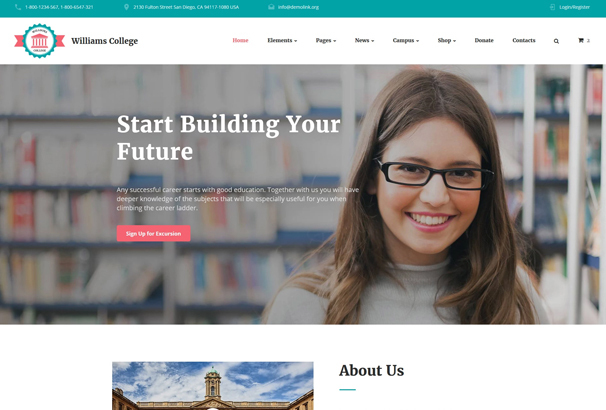 This highly responsive template has a very rich and vibrant user interface with stunning visuals that is sure to attract a lot of students. The theme is modern, with sleek animations and amazing functionality. It also packs an e-commerce page template, with great contact and subscription forms. As the name suggests, if you are a teacher looking to advertise your services, then this is one of the best themes out there. This highly responsive theme is minimalistic with pixel perfect icons and soft colours giving a very professional ambience to your website. With all required functionalities included, it makes sure to cover all aspects of your business. This theme boasts a snow white design providing maximum readability with soft colours and high contrast text. The grid based structure ensures easy navigation. 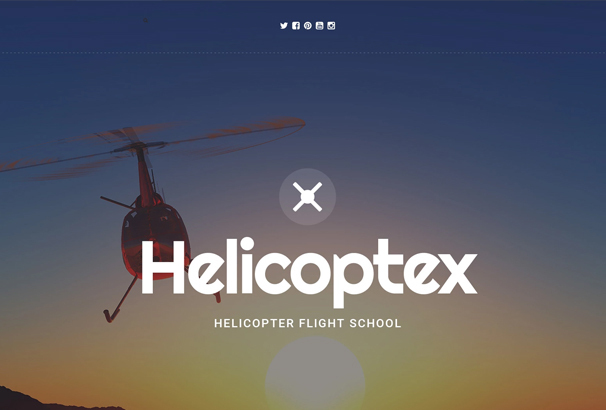 The parallax effect background provides a wide intro area which provides a 3d illusion. It also comes with full cross browser support and clean coding. 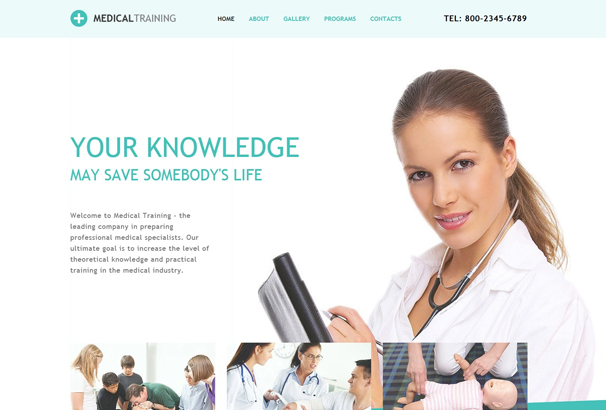 As the name suggests this template has been designed to cater to the medical profession. The blue colour palette and sleek design has a very positive aura. The customizable layout can be used to provide relevant information as well as look appealing and welcoming to those who are willing to study. With Google Maps integrated, anybody can reach you easily. 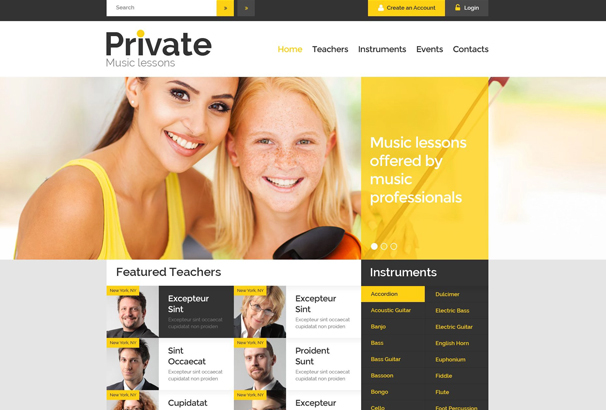 This is a very cool theme for music learning websites. The colours, lines, fonts and layouts offer a very attractive persona to the site. The embedded video also provides a nice platform to show your skills and advertise your passion. The trendy menu and student testimonials featured in the slider, makes it highly dynamic. 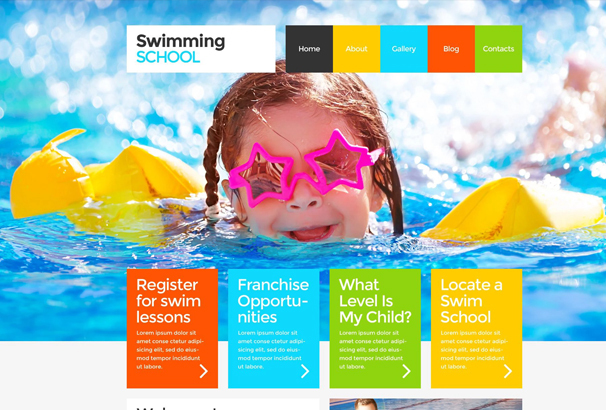 This a great template for showcasing your swimming school establishment. With multicoloured blocks which help to arrange your content in a very organized and vibrant manner, the theme looks very attractive. The large background photos with sliders make the entire process very rewarding. For any elementary school, a clean layout with attractive graphics is very important. This theme does that and more. The eye catching banners and multi column structure offer a fun visual experience. 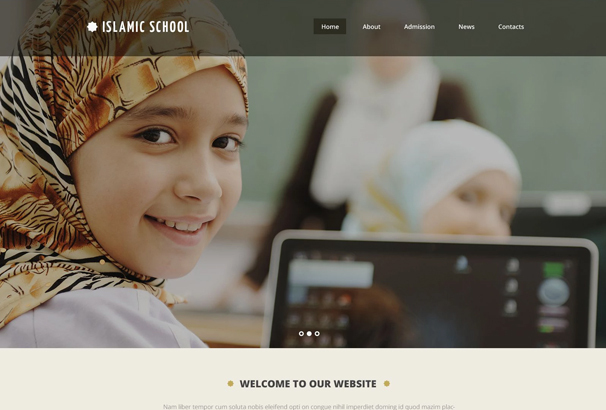 The layout has been kept very simple, so that even kids can access the page with ease. This is a theme for schools which require serious study. 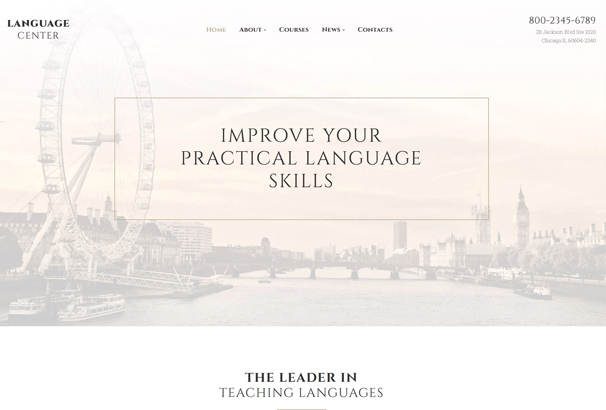 An innovative feature of this theme is that there is a progress bar included through which your students can keep a tab on the progress of their course. All features that you would need for a fully functional school are present within a very interactive interface. 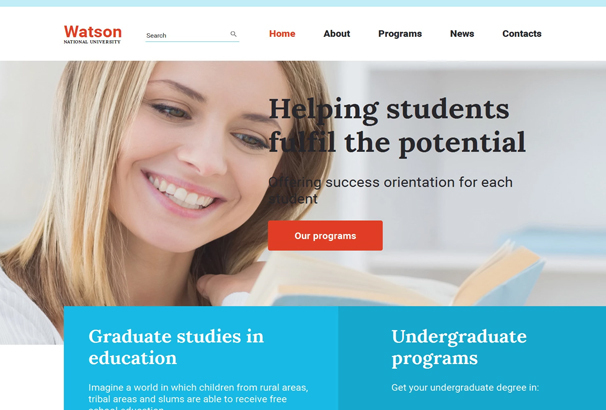 This template was created specifically to cater to education websites for universities, schools and other institutions. It has a very clean and modern decor with flexible sliders to show current students and other academic programs. 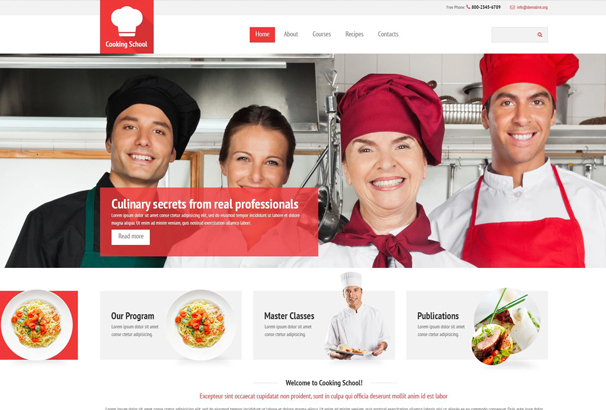 It is a fully functional theme with a professional look. This theme is designed for college communities and houses. It has a neutral design for application in both sororities and fraternities. The two sliders work to create a friendly atmosphere and providing latest news and images. 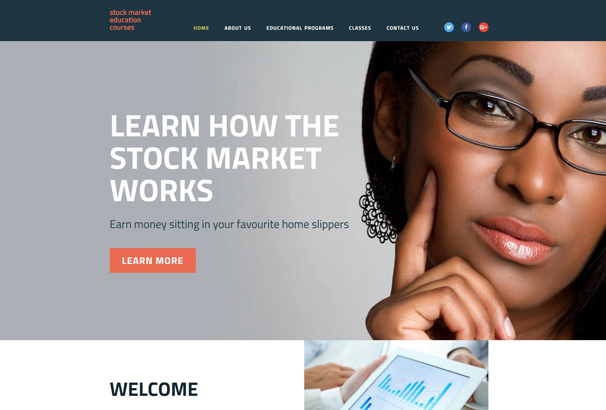 The theme is very well designed and looks appealing. 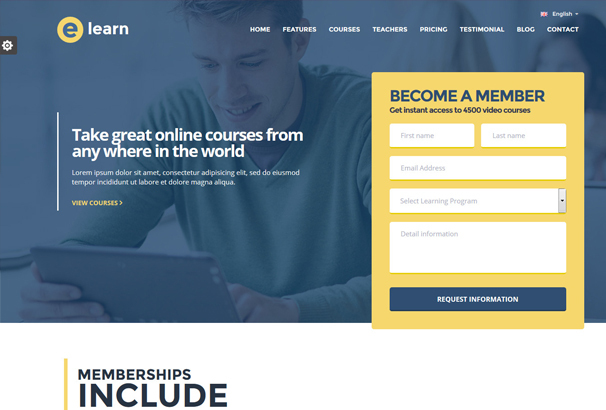 The template is very nicely designed with stick to the top menus and high quality sliders for promoting your latest courses and programmes. The interface is very user-friendly with easy to reach buttons and very functional elements. The highly responsive screen makes it suitable for viewing on all devices. This theme pertains to teaching and education and particularly for religious schools. It has a large hero area at the top and a full width image in the content section. The clean layout and simple decor with high functional elements make it very useful for all kinds of education. You can also upload audio files of lectures to educate students. This is a great template for cooking schools. It has a very delicate design, which accentuates the colors of images. This modern looking theme features a full-width slider at the top with images and buttons with hover effect. The responsiveness of the theme is also top notch. 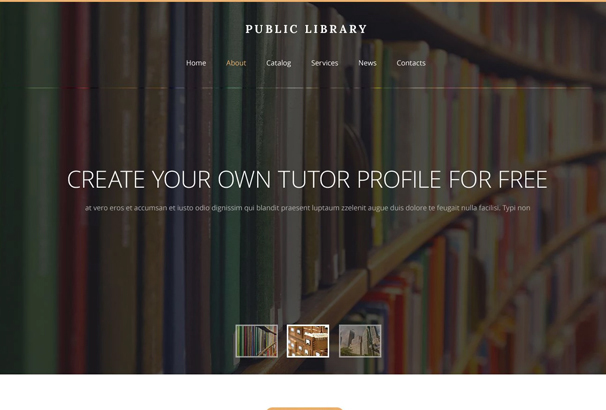 The public library theme is designed specifically for directory based websites. It is structured to provide for easy navigation to find necessary data easily. The subdued images with light backgrounds put the visitors focus on the content. The fluid layout works very smooth and overall the theme is very fast. If you need a visually stunning theme with great functions then this theme will probably make the mark. 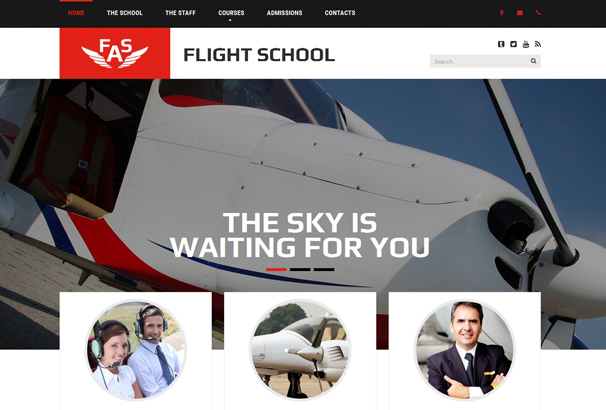 It has been designed for flight schools and such gives prominence to the visual element. It has parallax background and social media widgets and a lot of other functional elements. 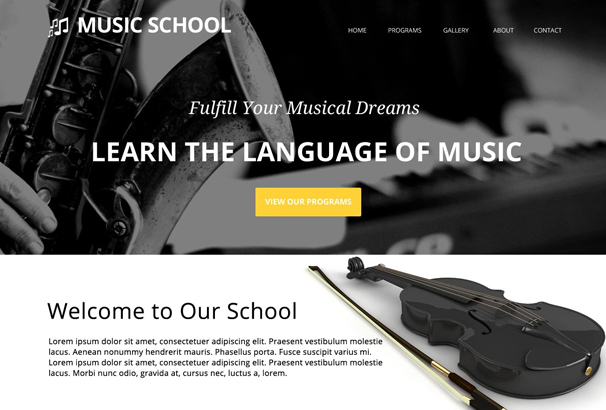 This dedicated music education template is nothing but gorgeous. The retro sliders and image gallery will definitely be appreciated by the users. The layout is mostly black and white with yellow elements which make the content more noticeable. 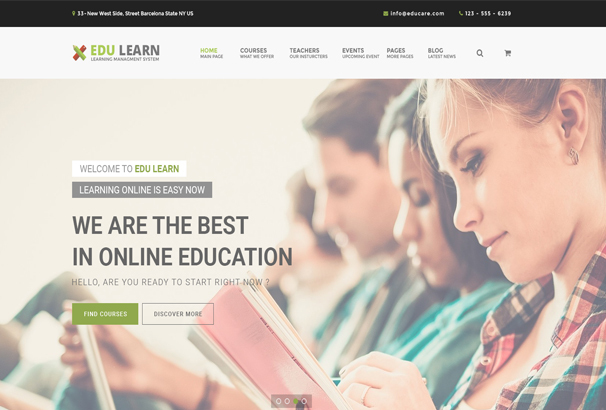 This highly responsive theme combines audio visual elements to craft a very interactive theme which is suitable for online education centers. The clean look with well-arranged structure offers the site visitors pleasant user experience and a classroom environment. The template is easy to customize and has limitless potential. 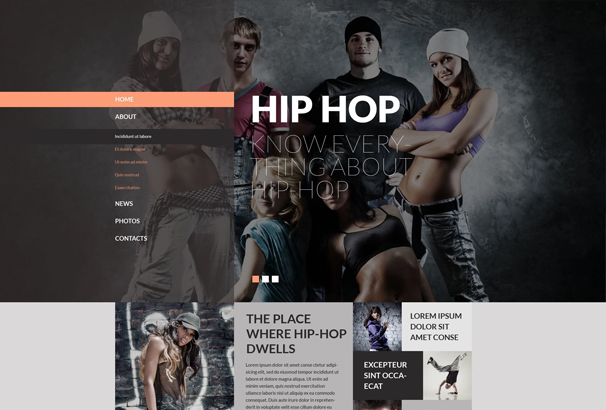 This theme is designed for dance classes and elevates the attractiveness of the content. The theme is content heavy yet the design is so sublime that it doesn’t look cluttered in any way. The photo backgrounds make the site vibrant and fun and the other features make it an attractive website for the visual arts. This is another dance themed template, which is very attractive thanks to its black and white palette. It offers a stylish representation of your institute, which will catch fancy of your target audience. The organized structure of the template gives ample opportunities to describe your institute and your instructors. 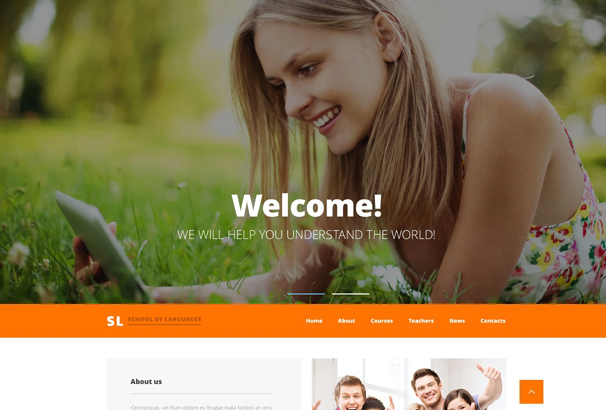 If you have an educational agency then this theme will be perfect for you. It has a neutral light grey colour with soft tints that highlight the most essential content. Learning programs have simple icons which make them more welcoming. All essential functional features are present which makes it sublime. This template conveys an atmosphere of fun and learning which is essential for any learning initiative. The slider with preset images of young smiling faces and bright colors create a cheerful environment. The layout makes for easy navigation and ease of reach for information about the school, teacher, news, courses etc. This template has a responsive design along with parallax background for very immersive display. The design of the template is very trendy with the pleasant user interface. The intelligent content blocks make sure that you don’t miss out on any important information. 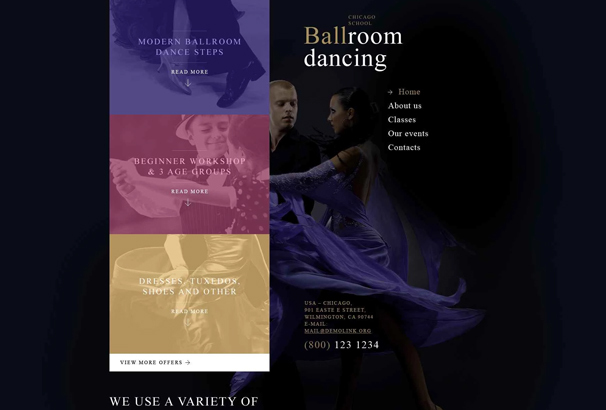 This a great theme for dance schools with stunning images and beautiful layout. This is a professional template with a lot of custom features and customization options. The design option, as well as customization of the same, allows you to make the site truly unique. 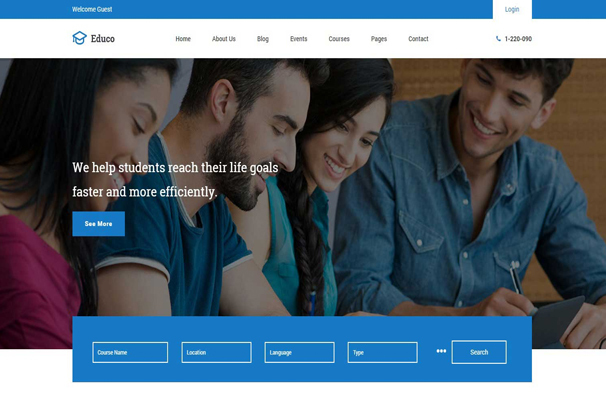 The vast functionalities of the theme make it perfect for business schools, through which you can expand your audience and drive more students to class. This religion based template works best for religious schools. The decor is serious and reserved yet manages to look welcoming. The modern design with the sophisticated use of sliders displays all relevant information for the public. 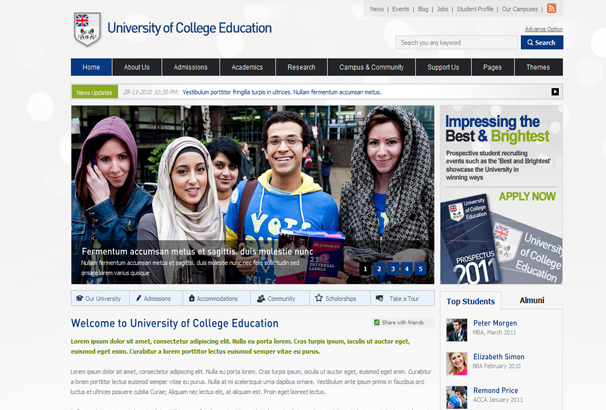 The home page is attractive to first time visitors. There is also a parents’ testimonial page for positive reviews. 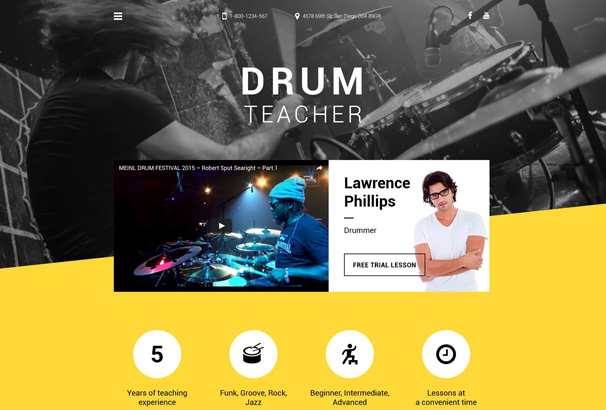 This template is for musicians and music educators. It has a very matured and professional vibe that will make your initiative more visible in the community. The lively theme will appeal to your visitors with stunning imagery complemented with yellow page elements. The content is categorized by teachers, instruments, and events which make it very easy to navigate. For dance schools and the creative and visual arts, this theme is one of a kind. With excellent immersive display, you can transport your visitors to the world of dance and emotions. The Home Page is designed to accommodate every query that your visitors might have, with clearly defined sections. You can also integrate videos and show your exquisite skills. 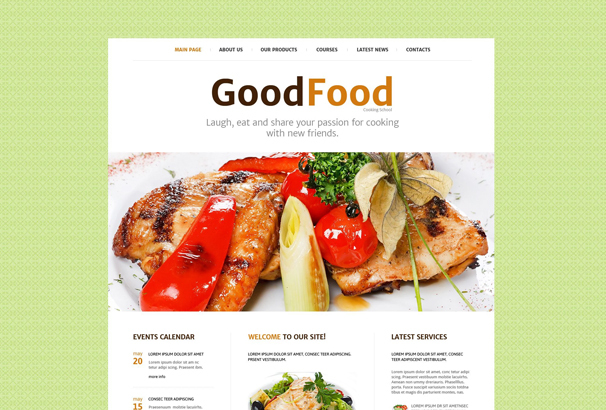 Foodies and cooking enthusiasts will find this theme very appealing. It has a clean user-friendly interface with red graphic elements offering an organic look to the site. The lazy load effect and HTML JS animation will make your web pages load faster and seem livelier. It has a responsive slider with a great gallery to provide stunning visuals. 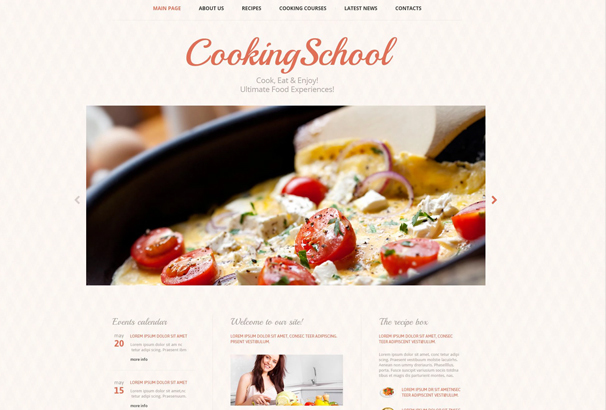 This is another cooking school based template which feeds on the passion of good food. The green and white layout make the theme look like a table cloth, with delicious meals on display in the slider. The menu has a fixed position, making the site navigation very easy. 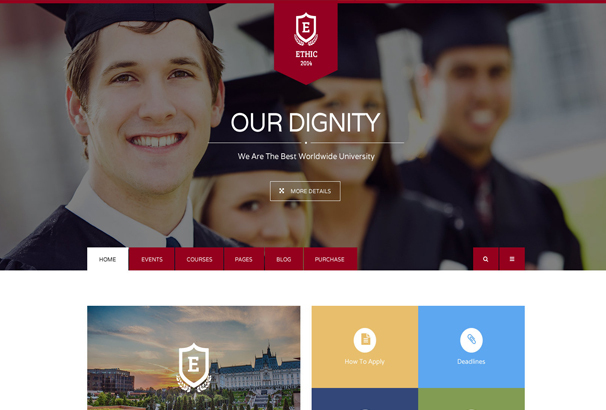 This template has been designed for colleges and universities with a very stylish interface. There are 4 color schemes to choose from, each offering a unique decor. All relevant sections are very nicely demarcated, with sober animation and lively colors. This professional template for education and learning management system comes packed with creative design layouts and fully functional features. The highly customizable components allow for a lot of flexibility. A clean template with all modern facilities is appreciated by many. And if you are among those, you will really enjoy this theme. It has 12 PSD files included and the latest Bootstrap framework. It is optimized for search engines and maximum speed. There some unique layouts with highly customizable features, that makes this theme stand out. This is one of the most affordable templates with a clean design and tons of pre made pages that you can modify according to your need. 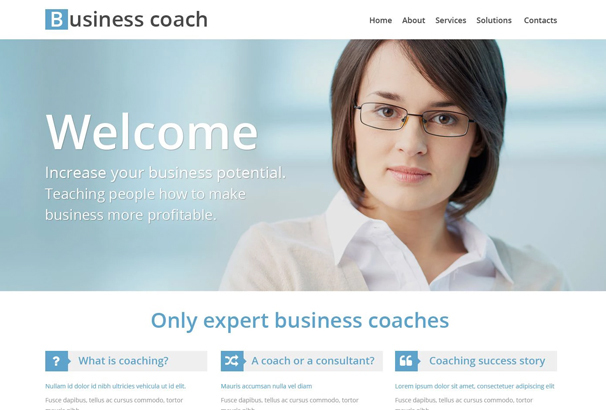 The layout is very responsive and comes retina ready for stunning visuals. The theme is light and very powerful. This theme comes with full cross browser compatibility and responsiveness. There are 7 Home Page versions and 8 Blog versions for your use. There are events page, course page and community pages included as well. With a lot of vibrant color options and RTL support, this theme packs good looks with very good functionality. If you are looking for a modern theme with flat colors and clean coding, this theme is something that you should look into. It has 5 fully responsive layouts and 8 color variations. The filterable portfolio page can also be used for maximum impact. It is a multipurpose theme that can be used without any issue for a lot of other niches. This multipurpose theme comes with 80+ HTML pages with 4 different layouts and 5 different Home Pages. The responsive design works great with the 5 awesome sliders. You also have the option of 9-course pages and 3 contact pages to make your website as functional as you want with no lack of design options.